So I know this isn’t a restaurant, but Leona’s Ice Cream Sandwiches have been sent to us by the heavens (AKA Christa, Katie and Leona [the dog!]) and are just too delicious not to write about.. and I don’t discriminate against the structure from which I obtain my food. These aren’t just any regular desserts. They are made with fresh, local, seasonal ingredients and dairy products. If you look on the back wrapper, the short list of contents could pretty much ALL be found at neighborhood farmer’s market, like cream, sugar, wheat flour etc.. AND GET THIS! They treat the ice cream with a natural enzyme, reducing the lactose content to be 85-90% LACTOSE FREE! CAN I GET AN AMEN. They say the first step is acceptance.. but I think I’ll always be in denial of my lactose-intolerance. So I thank you, Leona’s, for making the consumption of your dairy that much more enjoyable. I first discovered this wonderful addition to Pittsburgh’s food scene via social media. Christa, the wonderfully pleasant and sunny “dreamer” behind Leona’s flavor combinations, as well as operations and inventory, popped up in some social media feed at some point and I was instantly a stalker. These little gifts of “hand-held happiness” are conveniently stocked at retail locations such as Zeke’s Coffee in East Liberty, the 52nd Street Market in Lawrenceville and a few others. 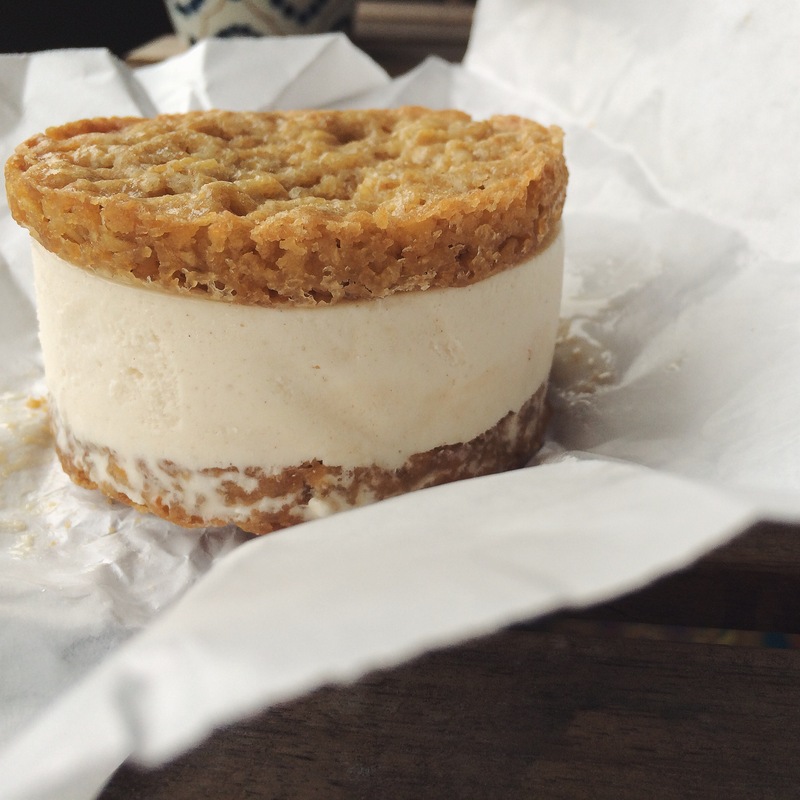 The Leona’s trike can ALSO be spotted pedaling around the city, visiting different local events, which is where I tried (and became addicted to) these ice cream sandwiches. The lovely neighborhood of Shadyside hosts a myriad of community activities, one being Weather Permitting. Sadly, the last one of the summer just passed, but it’s a great gathering held at the Shadyside Nursery on Ellsworth, where local food trucks park and bands play. I became a regular at this event just to get my Leona’s fix. This past Sunday, my boyfriend scored us probably the 2 best sandwiches we have sampled thus far. 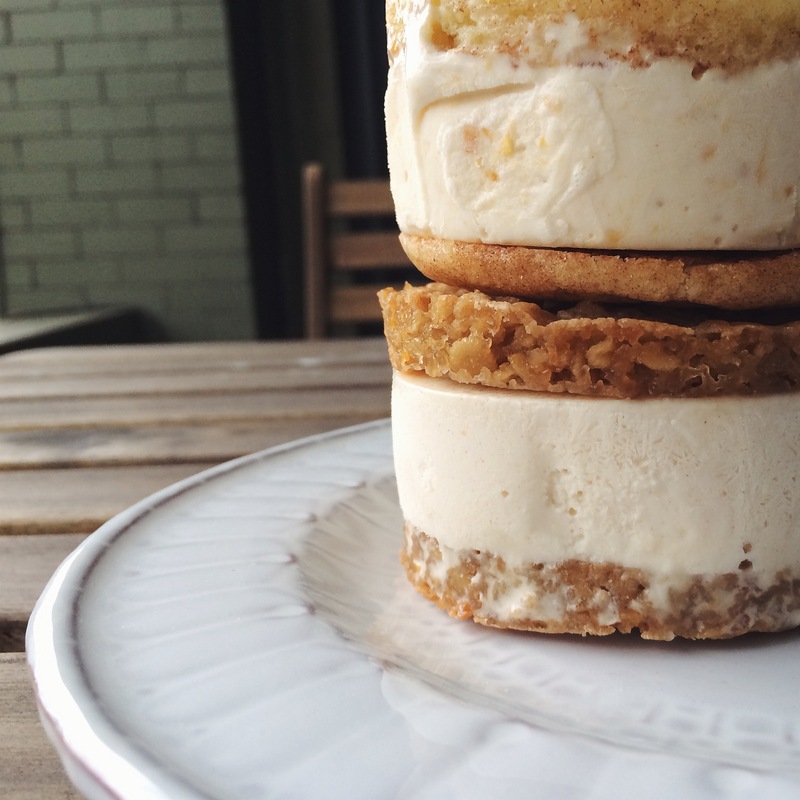 All of the sandwiches are $4.50, and these two are the Roasted Peach Ice cream on a Snickerdoodle, and Cinnamon Ice Cream on an Oatmeal Lace Cookie. OOOOO EMMM GEEEE. 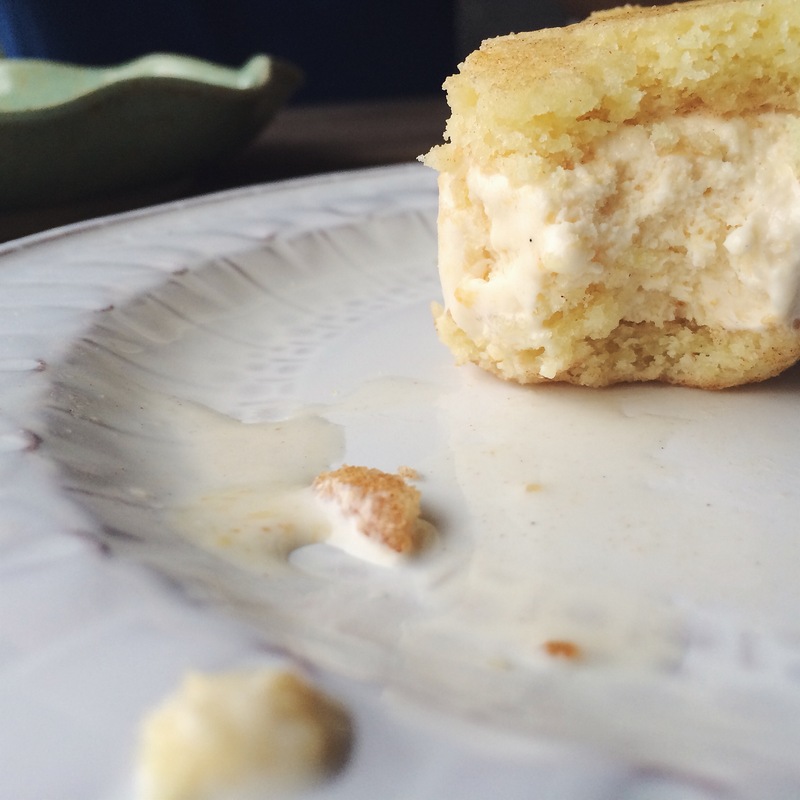 I’ll start with the little Oatmeal Lace number.. this ice cream sandwich blew my mind. 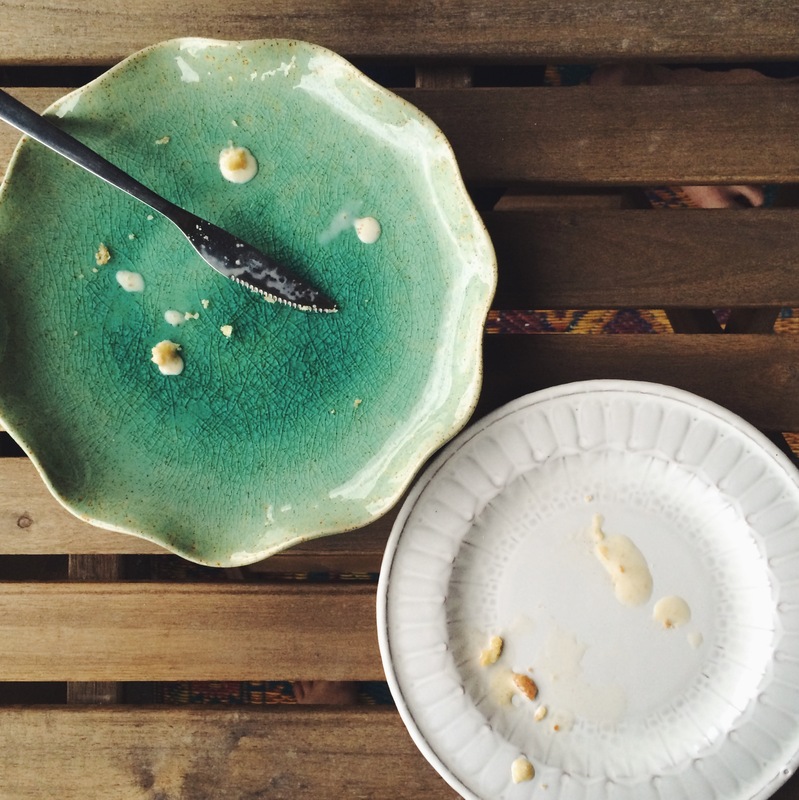 The cookie was perfection: buttery and chewy and perfect and more perfect. My Grandma wasn’t a very good cook, but if she was, I imagine this is where I could insert the phrase “these tasted JUST like the cookies my grandma used to make!” In addition to this perfect cookie, the cinnamon ice cream blew my mind. The cinnamon was not in the least overpowering, but just enough to wonderfully compliment the buttery richness of the cookies. Next, the Roasted Peach. Like, wow. This particularly selection was made with fresh roasted peaches from Chambersburg. 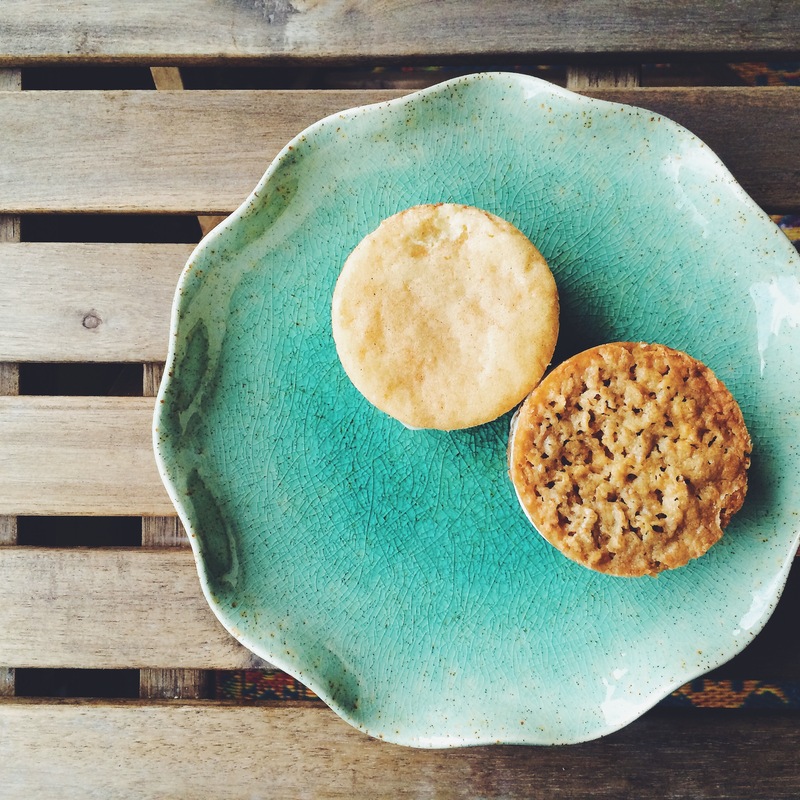 If you follow @dreamerofcream on Instagram, you will see her amazingly fresh farm finds, and catch glimpses into her next round of recipe testing. The pics of these Chambersburg peaches were exceptionally wonderful looking, and the ice cream they yielded lived up to the hype. Seriously you will not taste creamier, more delicious peach ice cream. It’s sweet and tangy, but not over the top. 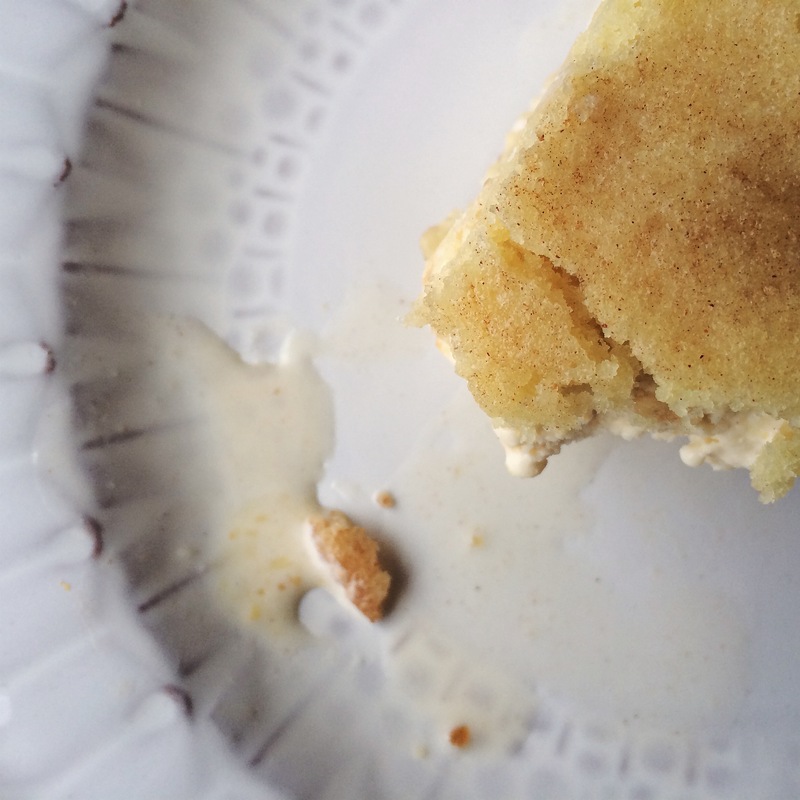 AND THAT SNICKERDOODLE. Lightly spiced and oh so soft and chewy. Seriously good. I have also sampled their Black Raspberry and Lime Curd on a Sugar Cookie, Vanilla Bean Ice Cream with one side Peanut Butter and one side Brown Butter Chocolate Chunk, Mixed Berry on Shortbread, and Fresh Mint on Chocolate. And just let me tell you, each one is wonderful. If these flavors aren’t convincing enough, they also offer Coffee Ice Cream on a Cinnamon Sugar Donut Cookie (like seriously? ), Chocolate Cherry Ice Cream on Chocolate Fudge, and Maple Bourbon Bacon Ice Cream on a Pink Peppercorn Shortbread Cookie….. COME ON. The list goes on (for a full list of flavors – just check out the website!) It should be noted that she seriously uses all fresh ingredients, so the flavors are in constant rotation. But each one I’ve had is better than the last, truly. 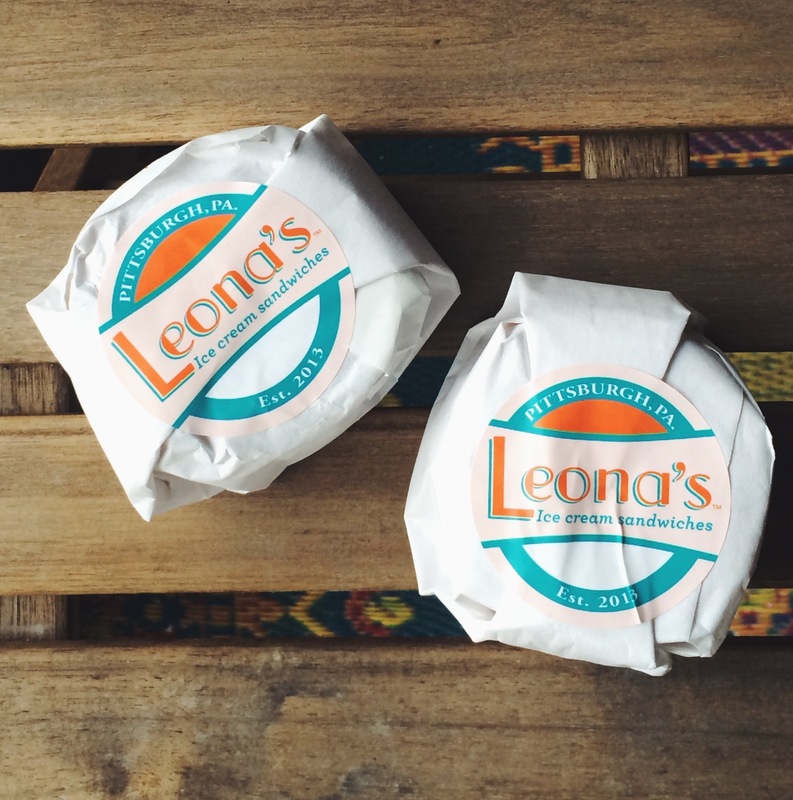 I seriously track down Leona’s any opportunity I get.. and I can’t wait to try more of their delicious, flavorful, seasonal treats. Follow them on Twitter! (@LeonasLLC!) It’s the best way to keep up with flavors, upcoming events, and which stores are newly stocked. At the events I’ve been to, she usually has 4/5 flavors. I highly recommend getting 2!! The more the merrier. 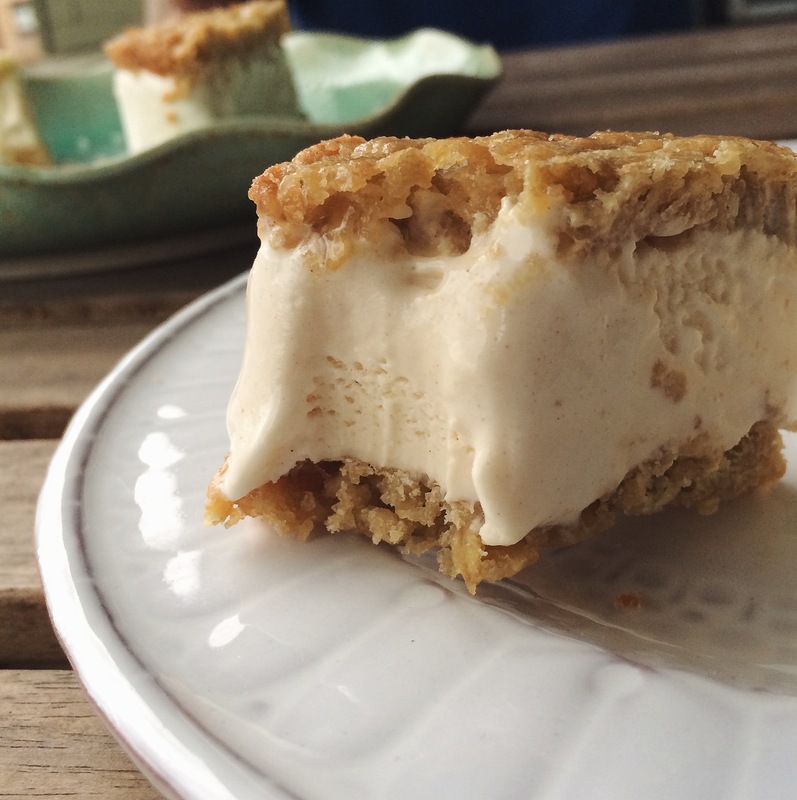 To that point – these ice cream treats sell like hotcakes. So don’t be late! So keep your eye out for Leona’s!! Whether you visit one of their retail locations, or stalk them on Twitter like I do – find it and enjoy it. It’s the best ice cream around! !